The Rock Xtreme CTX Pro looked familiar, as it shares the same chassis as the AJP M575U. There's nothing wrong with that at all: it's got the practical front panel, has a good trackpad, an excellent keypad and looks great, too. This system is arguably even more stylish, because it replaces the ribbed grey lid used by AJP with a classier all-silver model. It also comes with the same SRS sound system, delivering a 'virtual 8 channels' of sound through its two small speakers. We're not sure about that, but they do sound better than most of the competition (though not quite up to the standards of the HiGrade UltiNote). You also benefit from a huge range of ports, including FireWire, USB, memory card reader, DVI and Gigabit LAN. This notebook is crammed with kit. This only makes it all the more remarkable that the system runs so coolly, making it more comfortable to use and prolonging component life. 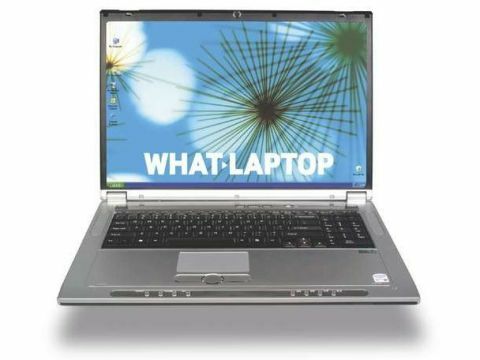 This notebook is similar to the AJP M575U then, but look closer and you'll find many improvements. It uses the fastest CPU here, for instance, in the Core 2 Duo T7600. Its 512MB RAM NVIDIA GeForce Go 7900 GTX graphics card delivered a desktop-beating 8,084 in 3DMark 05. When you're not playing games, you'll appreciate the easy-to-read 1,680 x 1,050 resolution on the bright, sharp, 17-inch screen.